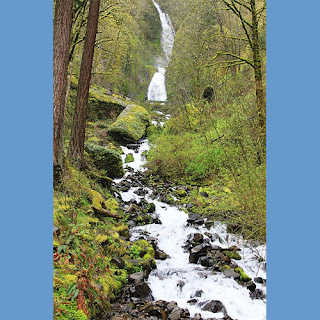 One of the many thing the Columbia River Gorge is known for is it's breathtaking waterfalls. There are many many trails to choose from, but if you are looking for a day hike this almost 5 mile loop is perfect. With 8 named waterfalls, and countless other smaller ones, it is the perfect way to spend a day. This is a waterfall lover's paradise. There are eight named waterfalls on this trip as well as countless cascades and intermittent falls. The loop can be hiked either way and it can be started from either trailhead. I prefer to start at Multnomah Falls, so I can end there with munchies. I like to get the boring stuff out of the way quick, so this describes a route that goes to Wahkeena Falls first, then up and around. Start in the west end of the Multnomah Falls parking lot at a small sign pointing out the Return Trail #442. This trail goes up a bit before dropping below an overhanging basalt cliff. Working it's way along just above the highway, the trail passes a weeping wall, then a good sized talus slope. In half a mile the trail reaches the Wahkeena Trailhead. The Wahkeena Trail (#420) starts with some beautiful stonework and a wooden bridge over Wahkeena Creek. The trail climbs in one long switchback to a stone bridge at the base of Wahkeena Falls. Expect a bit of spray on the trail here year-round. In winter, things can get really icy. From here, the trail starts up a pretty steep section, climbing about 300' in about half a mile. There are beautiful rock walls, another bench cemented into a wall and better views the higher you climb. At the top of this first climb, you'll crest a ridge. Follow the pavement out to the point, called Lemmon's Viewpoint. A plaque here commemorates a firefighter who gave his life fighting forest fires near here. The views from the point are really good up and down the river. The main trail turns to dirt here and quickly enters Wahkeena Canyon. This is a very narrow canyon, just wide enough for the creek and the trail. Every step is up, but every step is rewarding as the creek tumbles past. (Please be aware that a footbridge washed away during the winter of 2007 and has not been replaced — the crossing can be negotiated with some care thanks to a new bridge improvised by hikers.) The trail switches back a few times and soon you'll reach Fairy Falls, a beautiful fan form falls right next to the trail. There's a bench here to relax on while you take in the views. Above Fairy Falls, the trail makes several more short switchbacks and reaches a junction with the Vista Point Trail #419. Stay to the right here on Trail #420 and climb another 200 feet to a junction with Angel's Rest Trail #415. A quick 100 yard side trip will bring you to Wahkeena Spring, well worth the jaunt, even if you're carrying your own water. Back on the Wahkeena Trail, continue climbing to a 4-way trail junction. Continue straight on the Wahkeena Trail. The great news here is that you're done climbing. The trail traverses the ridge eventually dropping down after almost a mile to join the Larch Mountain Trail #441. Turn left on the Larch Mountain Trail, relax and enjoy the walk. You'll pass beautiful cascade after beautiful cascade. The trail goes right past the lip of Ecola Falls, once known as Hidden Falls. There's a scramble down the creek level for those of us that are quite mad. The next plunge Weisendanger Falls, once known as Twanlaskie Falls and Upper Multnomah Falls, has much better access, with an overgrown trailside view from the top and numerous easy photo spots below. The trail passes through a natural rock overhang called Dutchman Tunnel, then passes three 10-15' food waterfalls known as Upper, Middle and LowerDutchman Falls. Soon you'll cross Multnomah Creek on a creatively hidden culvert and you'll enter Oregon's tourist mecca.